In photo (from left) are Phoenix Petroleum COO Henry Albert Fadullon, Meralco chief technology advisor Gavin Barfield (at the back), Meralco head of supply chain and logistics management Ruben Benosa, Meralco first vice president and head of networks Ronnie Aperocho, Meralco senior vice president Alfredo Panlilio, Meralco CFO Betty Siy-Yap, Phoenix Petroleum vice chairman Romeo De Guzman, Phoenix Petroleum director Joseph John Ong and Phoenix Petroleum vice president for external affairs Raymond Zorrilla. MANILA, Philippines — Phoenix Petroleum Philippines Inc. has added Manila Electric Co. (Meralco), the country’s largest power distributor, to its list of commercial clients. In a statement, Phoenix Petroleum said it has been awarded the contract to supply and deliver fuel to Meralco. Under the contract, Phoenix will supply fuel, particularly its new fuel additive Phoenix PULSE Technology, to Meralco’s 11 fuel stations. Meralco head of legal and deputy general counsel William Pamintuan said the contract underwent bidding and passed the necessary technical requirements. 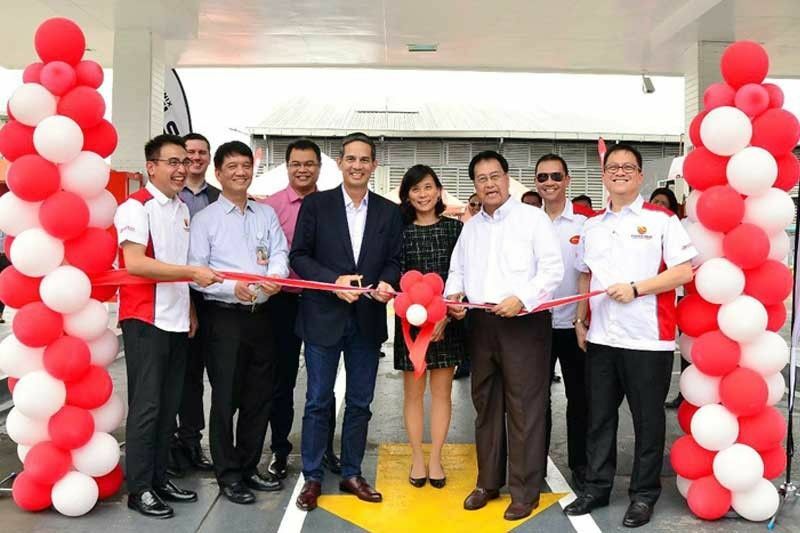 “We believe that Phoenix, a brand synonymous with high value products, will certainly help ensure that our fleet of vehicles get the high quality fuel it needs to continue rendering uninterrupted service which Meralco needs as a 24 hour service company,” he said. In a text message, Phoenix Petroleum vice president for external affairs Raymond Zorrilla said the contract was bid out to supply 400,000 liters per month. “We are now actually talking about other aligned services we can do for them,” he said. Phoenix Petroleum is among the country’s top three providers of fuel to a wide range of commercial and industrial businesses in power, marine, manufacturing, transportation, aviation, and other industries. Among its commercial accounts include Cebu Pacific, to which it supplies majority of the budget airline’s requirements, and Philippine Airlines, which the oil firm provides the flag carriers requirements outside Manila. The company gained new key accounts and won bids last year to supply companies in the land transport, construction, mining, power, manufacturing, marine, fishing, and shipping industries. Phoenix Petroleum recorded a 65 percent jump in net income to P1.79 billion last year. Sales volume to commercial and industrial businesses grew by 15 percent, while aviation rose 13 percent as the oil company firmly established itself as the third major player in the commercial and industrial segments. This has fueled the growth in sales volume and helped the company grow its consolidated revenues by 52 percent to P46.3 billion. Earlier this year, it expanded its business into convenience retailing after acquiring Philippine FamilyMart, and to asphalt manufacturing, marketing, and distribution through Phoenix Asphalt Philippines Inc.
MANILA, Philippines — What’s the best way to start the day? I feel like this is a question we all know the answer to, but don’t really follow ourselves. (Yup, it’s breakfast). We’re always on the go, either rushing through the rush hour to work or zipping to school, and oftentimes forget about grabbing a bite to eat in the morning. Which is why McDonald’s celebrates National Breakfast Day year after year. As they celebrate for a sixth year, they gave away free longgadesals in almost 500 branches nationwide last Monday, March 19. Surprising new breakfast converts and regulars alike were celebrities Atom Araullo, Alden Richards, Maine Mendoza, Young STAR cover stars Gabbi Garcia and Ruru Madrid, Maymay Entrata, Gabby Concepcion, Tony Labrusca, Donny and Hannah Pangilinan, Rocco Nacino, and Jason Abalos in different McDonald’s stores around the country. Aside from just giving away free sandwiches for breakfast, McDonald’s wanted to serve their longgadesals where it really mattered, by extending National Breakfast Day to Albay and Marawi. Last March 5 and 6, McDonald’s went to five different evacuation centers in Albay, Legazpi, and on March 11 to Bakwit Village Transition Shelter in Marawi. “National Breakfast Day has always been about meaningful mornings and new beginnings, and this year we wanted to extend this to those who need it the most,” said Kenneth S. Yang, president and CEO of McDonald’s Philippines. You can see more of McDonald’s’ visit online, where Atom Araullo sheds light on the moving stories of mothers who gave birth to their children in evacuation centers during the Marawi siege, endearingly calling them “Baby Bakwits.” It’s a heartwarming story of struggle, hope, and new beginnings, which is exactly what National Breakfast Day is about. Watch Baby Bakwit on YouTube.com/mcdonaldsPH. Share your #NationalBreakfastDay experience by tagging @McDo_PH. For more information, visit mcdonalds.com.ph. Filipinos have included the chicken inasal among the well-loved classic Pinoy dishes like adobo, sinigang, and kare-kare. And whenever they have a craving for really satisfying chicken inasal meal, they already know where to go, Mang Inasal. Clearly a contribution of Visayan cuisine, the chicken inasal has become a Pinoy staple because of its authentic flavor that has captured the taste even of Filipinos from other regions. “Inasal” is the Ilonggo term for “chargrilled” or “roasted meat.” The secret to its flavorful taste lies both in the marinade and in the roasting process. Mang Inasal has formulated a special marinade that it uses in preparing its flagship product. Also, as a commercial establishment, Mang Inasal has continually improved on the grilling system and procedure to ensure the consistently high quality of grilled chicken goodness that the outlet has been offering. And to further delight chicken inasal fans, Mang Inasal is proud to offer the “2-in-1 sa Laki, Nuot-sa-Ihaw-Sarap” quarter chicken. The chicken inasal’s humble beginnings can be traced to a small street in Bacolod known as Cuadra where a series of small chicken inasal stalls is owned by the Velez sisters. The siblings are considered the pioneers in mainstreaming inasal na manok, making entrepreneurs interested in offering their own chicken inasal with a twist. The founders of Mang Inasal built on the undeniable appeal of this Filipino cuisine, establishing its first branch in Iloilo. Through the years, Mang Inasal has successfully brought its own take on the Pinoy grilled chicken in fast-food style. Mang Inasal is one of the local fast-food chains that offers best-tasting Pinoy food by having a concept and ambiance that is truly Filipino. This is one of the reasons why its food is served on wares that carry the banana leaf motif to conjure the Pinoy’s use of banana leaf in serving and cooking food. Even the store’s ambience carries the homey, grillery that has been the trademark of Mang Inasal. Chicken inasal is best eaten with chicken oil over plain or garlic rice. At Mang Inasal stores, the chicken oil forms part of the condiments trio — together with soy sauce and vinegar –that allow customers to savor the meal at its most flavorful. Also, further reinforcing the Filipino diners’ preference for rice, Mang Inasal has been offering unlimited rice with all its paborito meals. It is the fun experience of mixing the condiments, and being able to fully satisfy their hunger pangs via unli rice, that have endeared Mang Inasal to a number of Pinoy food enthusiasts. Mang Inasal prides itself with its specially-marinated grilled chicken that offers “nuot sa ihaw sarap.” Among its offerings of Filipino food products, their Chicken Inasal contributes a big chunk to the brand’s total sales. This is the reason why Mang Inasal’s Chicken Inasal is the number one Pinoy grilled chicken brand based on studies made on this segment. With its promise of serving great food and bringing the joy of eating to Filipinos, Mang Inasal continues to improve its product quality and portfolio to win the hearts of everyone. The country’s largest casual dining chain operator Max’s Group Inc. (MGI) booked a net income of P626.69 million last year, up by 12 percent as increasing consumer affluence boosted earnings from its expanding restaurant network. MGI’s system-wide sales rose by 13 percent to P17.34 billion last year, while revenue increased by 11 percent to P12.66 billion, based on a disclosure to the Philippine Stock Exchange yesterday. Restaurant sales increased by 11 percent to P19.88 billion, driven by sustained same-store sales performance and revenue contribution of new stores. Same-store sales grew by 5 percent while overall transaction count was up by 13 percent. Amid rising urbanization trend and consequent worsening of traffic, MGI’s delivery business grew by 27 percent to P1.37 billion, as the group broadened online ordering channels and upgraded delivery infrastructure. Franchising operations also contributed to the 13 percent rise in commissary sales of P1.42 billion from P1.26 billion. The group’s brands include Max’s Restaurant, Pancake House, Yellow Cab Pizza, Krispy Kreme, Jamba Juice, Max’s Corner Bakery, Teriyaki Boy, Dencio’s, Meranti, Sizzlin’ Steak, Maple, Kabisera, Le Coeur De France and Singkit. MGI opened 78 new stores last year, 14 of which are located overseas. These brought the company’s store network to 673 branches, with 55 in various cities in North America, the Middle East and Asia. The company intends to focus on a franchising-led business model to drive expansion and improve accessibility to customers. With a planned rollout of 80 to 90 new outlets primarily through franchising its core brands, MGI seeks to set an active presence in key geographies, and at the same time, generate higher fee-based contributions to revenue. Capital spending this year was placed at P600 million.